How to make homemade tomato soup just like Campbell’s used to make! 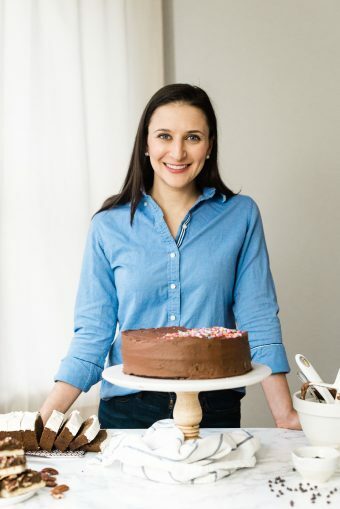 Actually, I think they still make it, but who needs it when this dairy free and real food version is just as easy, twice as good, and much better for you? 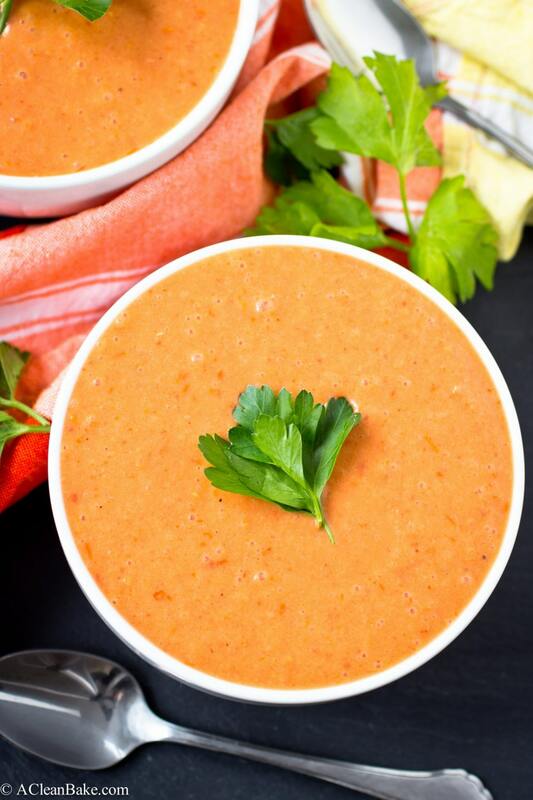 This creamy homemade tomato soup is gluten free, vegan, paleo, and Whole30 compliant. Best of all? It requires just a few pantry staples to make and is perfect for dinner on a chilly weeknight! Is there any combination of foods more familiar and soothing than homemade tomato soup? I think we all know the answer to that: no way. 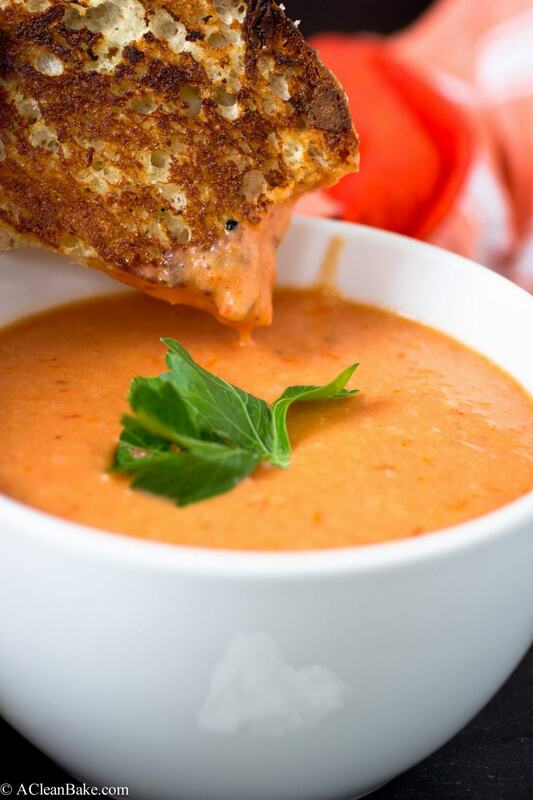 Actually, maybe the only thing better than a steaming bowl of homemade tomato soup is that bowl served with a dunkable grilled cheese (or grilled cheeze, for the vegan and lactose-intolerant crowd) sandwich on the side. As half of the country is probably still working on shoveling itself out of a snowdrift, there’s no better time to re-enact that classic Campbell’s commercial where the kid warms up with a steaming bowl of creamy tomato soup. Only…let’s face it, who wants to eat that shelf stable version with one million ingredients when an all-natural, homemade tomato soup made of only 3 ingredients (plus salt, pepper and spices) is just a few stirs away? That’s really it. In the time since I originally posted this recipe, I’ve simplified the recipe to use onion powder instead of fresh onions, but if you prefer to go the fresh route, feel free. You can read the note at the end of the recipe for this variation. Now, to make the soup, just heat up some olive oil, fry the spices (this helps unlock maximum flavor), and then add the contents of the two cans. Stir, simmer, serve. This easy tomato soup recipe is, in fact, everything it promises to be. Dozens of happy and full readers, who have written to me or left comments telling me how often they make this in their homes, would tell you the same! How to make homemade tomato soup! Who needs Campbell's when this super creamy homemade version is just as easy, twice as good, and much better for you? Heat the oil in a stockpot. Add all of the spices except the salt and pepper, and fry until fragrant. Stir in the coconut milk. Taste and adjust spices to your preference. Serve immediately, or store in an airtight container in the fridge for up to five days or in the fridge for up to a month. This recipe has been updated to make it even easier, and in doing so, the fresh onion was removed from the recipe. If you would like to use fresh onion instead of onion powder: sweat 1/2 cup thinly sliced sweet onion in the olive oil before adding the spices, tomatoes, and coconut milk, then use a stick blender to puree the soup until smooth before serving. There really is nothing better than a bowl of tomato soup on a cold day. This looks so delicious – I think I’m going to whip up a batch this weekend. I’ll take this over canned any day! And you’ve used coconut milk… Ohhh, this sounds so delicious Nora! I’ll take it! We’re not digging out of the snow here, but it is frosty at night. Still plenty of room for soup in the house! Thank you, Nora! Delicious! Well I thought our snow days were over but there is more coming down as we speak. It looks like soup is going to be on the menu all over the country for awhile longer! Brr! It sure is, Christina! Though it’s actually a little sweet thanks to the tomatoes! Love, love, love cream of tomato soup! I’ve been making mine with almond milk but I’m definitely going to try coconut milk next! Oh, almond milk sounds intriguing! I like the coconut milk because it adds some creaminess, but I’m going to try almond milk sometime too! Um, I’m not going to lie – I kind of love that commercial – I think because it signals that it’s almost Christmas-time! Anyway, back to the real issue at hand – this soup. It looks amazing and creamy and delicious. I admit that I don’t like tomato soup from a can…but homemade tomato soup? I can never turn down a bowl – this version looks so great! Yeah, it’s definitely a classic. I love what it represents – I just personally never like the actual soup! It always boggles my mind when someone chooses the canned stuff over something this easy. I mean if you have a blender, you’re good to go! mm this looks great, i love tomato soup! and with coconut milk sounds great. coconut anything is a winner!! Thanks, Beverley! It sounds like you and I are definitely on the same page that coconut milk can do no wrong! Oh man I could really go for some of this right now. That shot of the bread-dipping is making me drool 🙂 I love the use of coconut milk, works so well in creamy soups like this! What a pretty bowl of tomato soup! It is just the soup I need after receiving 6 inches of snow this past weekend here in Indianapolis. And, yes…who doesn’t remember that fabulous TV commercial by Campbell’s? Thanks for the trip down memory lane, Nora. 🙂 Pinning (and making), of course! Yum! 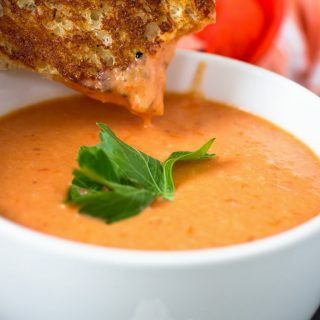 This looks amazing, I love tomato soup, especially when it’s rich and creamy! This looks like the perfect recipe for me, I’ll have to try it! Thanks, Harriet! I hope you enjoy it! Thank you so much for this recipe! My husband does not like coconut at all and it went it unoticed with this receipe. I personally loved the creaminess the coconut milk gave this receipe. However, since I do not have a handheld blender and I was afraid the soup would be too hot going into the blender, I blended the tomatoes straight out of the can along with the sauté onion, spices and coconut milk. Then, I brought that to a boil and the result were amazing. I added basil. Absolutely delicious! Even my 3 yr old loves it, will definitely be making again thank you so uh for the recipe! It’s so great to know that this is kid-friendly! I’m thrilled you and your family enjoyed it, Rachel! made this while my husband is out of town this week because tomatoes give him heartburn. it is BETTER than Campbell’s, yet evokes the same food memory from my childhood. appreciated that the quantity made enough to share a large jar with a friend! this one’s a keeper for sure. Better than Campbells? Hey’ll I’ll take it! (And agree!) Yes, it is definitely enough to share, or live off of for a couple of days. I’m thrilled this recipe satisfied you and your friend’s bellies! Getting ready to make my batch now! Can’t wait to try it! Lots of snow outside now and we need to stay warm and cozy! Sounds like the perfect dish right now! I hope you and your family enjoyed it! Would light coconut milk work well here? It looks great and I love a good tomato soup. I’m not a vegan or vegetarian, but I aspire to stop eating meat and so I’m taking baby steps. Transitioning will be easier if I have an arsenal of tested recipes! I grew up on Campbells cream of tomato soup full of glutinous crackers and made with milk. Now at 51, just found out I am allergic to dairy, both proteins and I miss my tomato soup. I was shocked to see that campbells had gluten among many other icky things. I am super picky though and can’t stand any tomato in pieces or chunks. Could I substitute tomato sauce instead and any idea how much? I am weird that way, love ketchup, and salsa but as soon as I get i home I run it through the food processor to get rid of the chunks. Love pizza, italian food etc, but no tomato chunks or clots, what i like to call them, lol! Hi Lynn! I know exactly what you mean. I’m not the biggest fan of tomato chunks either! I think this soup will be right up your alley though, since it calls for crushed tomatoes (basically a tomato puree; you may want to look for the can labeled tomato puree instead, if you can find them. Sometimes they are interchangeable which is why I used crushed tomatoes) and then you puree them once more in the blender before serving. It’s very smooth and chunk-less! I wouldn’t use tomato sauce because there are often lots of other flavors added to canned or jarred tomato sauce that may not work with this recipe. I made this soup today — it was perfect, however I would let it sit another hour or so (before heating it back up again) to let the flavors meld a bit more. It really is excellent and you cannot taste the coconut at all. I used light coconut milk. I also added a huge handful of basil (chiffonade). This soup turned out sweet because of the coconut milk. Definitely not a fan of this recipe. Maybe try a different ingredient instead of the milk? Did you use unsweetened coconut milk? It needs to be unsweetened. It has been 6 months since the first time I tried your recipe. 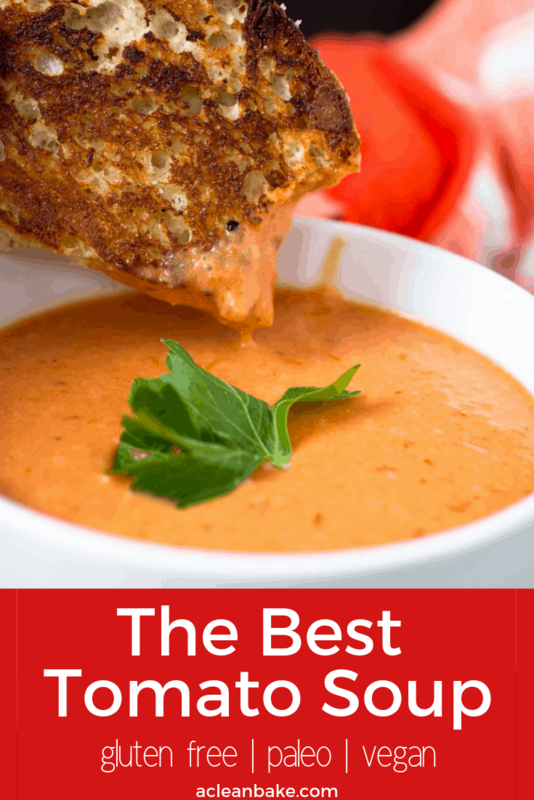 I have never been a fan of canned tomato soup, but one day I was craving tomato soup and grilled cheese, so I searched for a simple tomato soup recipe and came across this gem! Thank you so much!! I love that this recipe works so well for you and your family (except your husband, but he’s missing out ;))! Enjoy your camping trip! This looks delicious! With the tomatoes — I’m just confused because it says one can of tomatoes at one part, but then later says 4-5 cups of tomato purree. How many cans (of how many ounces) do you use? Thanks so much! Hi Bethany! You should use one large can (about 28 oz) of crushed tomatoes, which is about 4-5 cups. Sorry if that wasn’t clear! I was thinking of adding some gnocchi to this too!! Yummy! That would be delicious! Enjoy! I am always searching for good vegan recipes. This one is simple and DELICIOUS! We are huge fans of tomato bisque soup and grilled cheese sandwiches. This is a perfect alternative and VEGAN!. The only thing I added was about a teaspoon of cane sugar to cut the acidity! This will be a staple in our home. Thank you! That’s wonderful to hear! Thank you Helen! Just tried making this last night. It was so easy! The only thing was we didn’t have any red pepper flakes, just cayenne pepper, which I think I used just a little too much of, but it gave the soup a nice kick. Paired with a vegan grilled cheese, it was so comforting and yummy! That sounds like such an amazing meal!! I’m glad you loved the soup! I tried this tonight and I’d much rather buy a store bought dairy free and gluten free tomato soup. It’s bland and the coconut milk in it makes it taste gross. Feel free to adjust the seasonings to your preference (as the recipe states), but if you don’t like coconut milk you probably won’t enjoy this. I made this today and wasn’t disappointed! It’s really good. Thanks for sharing!